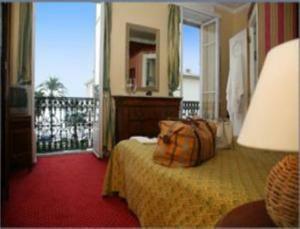 Situated on the famous Promenade des Anglais in central Nice, this hotel offers views of the Mediterranean Sea. It has an early 1900s-style décor and a garden with a shaded terrace. The air-conditioned guest rooms are equipped with a TV and free Wi-Fi access. All rooms have a private bathroom. Some room feature a balcony overlooking the sea or the private garden. A continental breakfast is served every morning at Villa Eden and can be taken on the terrace. With public parking nearby, the Eden hotel is 2.5 km from the market area. Nice Airport is 4 km away, and the hotel is 2.5 km from Nice Train Station.